After an extensive renovation to an old building and months upon months of anticipation, Sanford Brewing Company (SBC) recently had their soft opening. So far, I'd say it was well worth the wait. SBC is Sanford's second microbrewery, though they've just opened and have not yet finished a bath of their own beer, they have a number of craft beers on tap. The space is warm and friendly and inviting with some exquisite wood detail (give the custom made bar a look!). The brewing area is clearly visible behind some huge windows and two large garage doors were open on the mild afternoon/evening when we visited, a very welcoming space, for sure. We decided to have an early dinner here recently. We started with drinks. Though I originally chose to jsut have some water, i quickly spied some special sodas on their drink menu and chose a homemade raspberry soda. I'm glad I did because it was wonderful, a nice red raspberry flavor was complimented with a bit of mint and some lime juice. 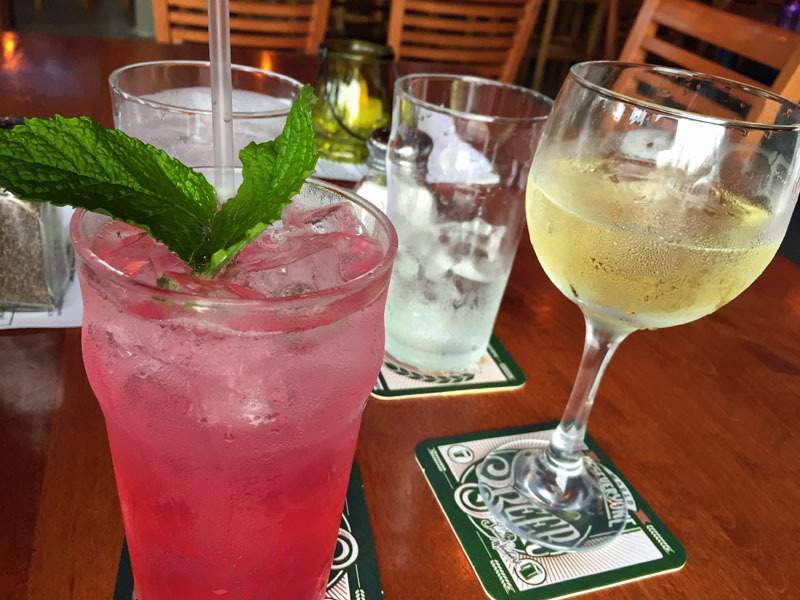 Though it was happy hour, our server was not very clear on just what was on happy hour, so when the bill came and i saw that a glass of Moscato was $10, i was a bit surprise. Even in a fairly nice restaurant, $10 for a glass of wine seems excessive. I will say, we were here one time early for a few beers, and they seemed a bit pricey for the size of the pour, too. But time will tell if those prices will draw people. But this time we came for the food, as we've heard good things. Tommy ordered the SBC burger, your standard burger, but much better than most. He ordered it medium (his preferred temp) but it came out a bit closer to medium rare (my preferred temp) which is probably why I thought it to be great. The bun was nice and soft, too. It was served with lettuce can tomato and came with a side of fries. Tommy thought the burger to be a bit overseasoned, too. The fries are big planks of potatoes. They could have stood about 30 seconds more in the frier to give them a better golden color, but they were indeed delicious and seasoned nicely. I ordered a Turkey Carver sandwich. The menu clearly states that this is a "shareable" sandwich and I would certainly agree--it was huge and I ended up taking half of it home. But it was oh-so-good, too. It's a cold sandwich but was very tasty. Served with lettuce, fried green tomato, bacon, and a sort of pimento cheese, it was a very good sandwich, i loved it! And still am, as a matter of fact. I will say this about the pickles that garnished Tommy's burger and my Turkey Carver--they were pretty bland and not very "pickly." I'm sure they were house made, but they needed a bit more kick, a bit more vinegar, and a bit more time to pickle. They were not that good. I hope they can improve, as home-made pickles can be a real asset to a menu item--these were not. I also ordered a side of the onion rings. They were served with a side of a spicy cheese dip that i believe is served with a number of other items. I like the cheese dip, though Tommy thought it a bit too spicy. I did not. The onion rings could use a bit of improvement, though. They were just OK. First of all, they were a bit greasy. The tempura type batter had come off some and the onions themselves (red onions which I liked) were a bit thin, and so not enough onion for the batter, IMHO. I hope that as times goes on they'll use their own beer in the batter, and maybe let the onions sit a bit and dry out (flour would help) before battering them to get a better batter coverage. Mind you, we ate them all and they were tasty, i just thought they (along with the pickles) could use some improvement. Sanford Brewing Company is very new, and it shows just a bit. But they are also working hard. They've been getting a lot of local attention from friends of ours, and rightly so. The night we were there, some friends came in to eat, and as we were leaving, more friends came by. I think they have a lot of promise, and once they are able to serve their own beers, I think this will be a great addition to the Sanford eating and drinking scene. Our second microbrewery (and a third is on the way) is a hit, and we'll be back, for sure. Give them a try, I recommend them. 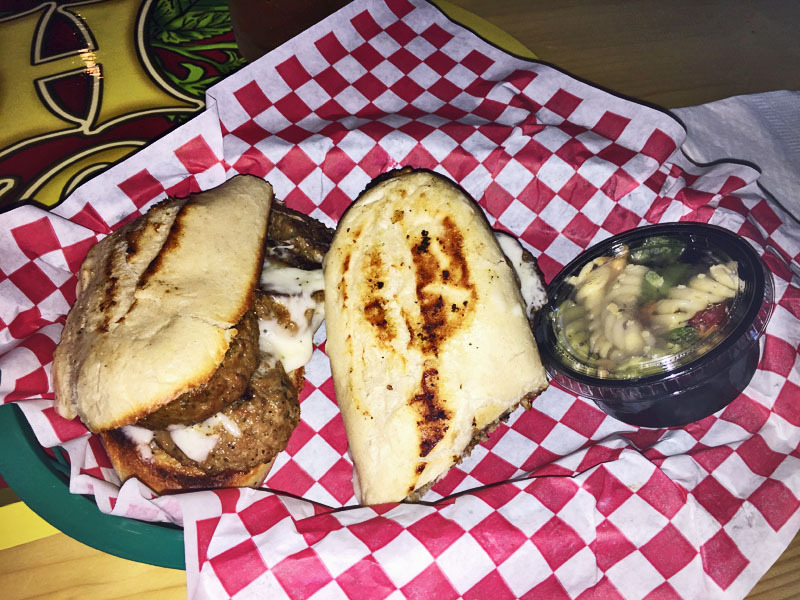 El Zocalo is a new Mexican restaurant in Sanford, opened in the space formerly occupied by Tony's Deli. I am not sure what happened to Tony's, but I never saw more than a person or two in it, any time of day, and was surprised it hung on as long as it did. 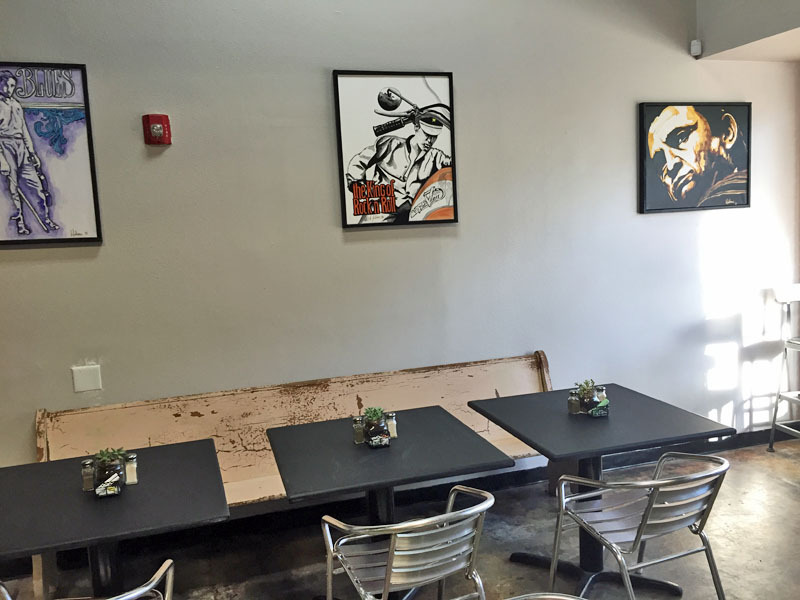 Nonetheless, the space had gotten a fresh coat of paint and is now a Mexican restaurant. I'd heard some good things about it on Facebook and so we recently decided to give it a try for lunch. We were quickly greeted and offered to sit wherever we wanted, and in no time at all some fresh salsa with chips appeared. This was pretty good salsa, too. It tasted very fresh, was a bit chunky as a good salsa should be, and had a nice fresh flavor. The cilantro was evident, the onions nice and crispy, and the tomatoes lent a nice, fresh flavor. This was a good start to our meal. Tommy had a chicken quesadilla and it was very good. The chicken was nice and tender and there was a lot of cheese. There was some lettuce, sour cream, pico de gallo, and guacamole in the center. 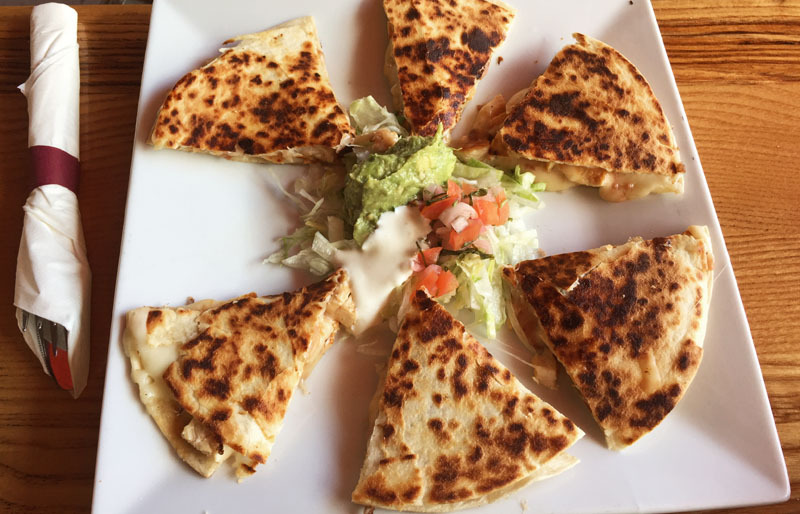 I had some of the quesadilla and it was very good. The guacamole also had a nice, fresh flavor. It's hard to ruin a quesadilla, and this one was as good as any I've had or made. I had the three enchilada meal for my lunch. One was ground beef, one shredded beef, and one chicken. It was served with yellow rice and refried beans on the side and topped with the chosen red sauce (green is also available) and some sour cream, and had a small lettuce salad on the side. My least favorite was the ground beef, it was nothing special and i could taste a lot of green pepper in it--not my personal favorite taste. But the other two were very good, the chicken and beef were both tasty and tender. 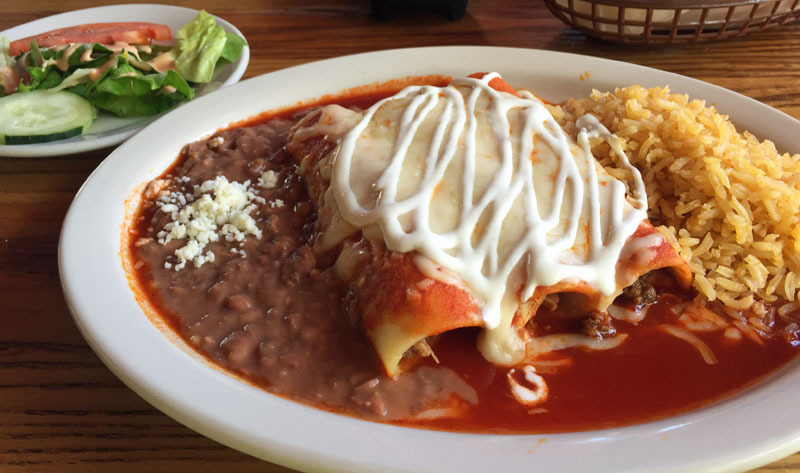 Overall, i really liked my enchilada dinner, and it filled me up. 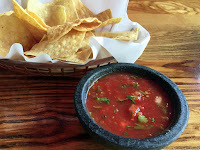 It's always a bit dicey to visit a new place while they are still working out the kinks, but I have heard a lot of good about El Zocalo and if my first experience holds true, they may have a good long life in downtown Sanford. My only complaint is the lack of an online presence, I could not find them on the Internet nor on Facebook, and these days, social media is the way to go. But aside from that, we had a nice experience and will return again to try something else. I can't wait! 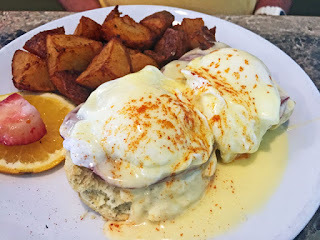 There are a number of Peach's location in the Sarasota/Bradenton, and I can see why they are so popular, good food, served well, at a reasonable price. This makes them "top notch" in my book. I ordered the Ranch Hand Omelet, bacon, ham, sausage, turkey, and a blend of cheeses. It was excellent. The eggs were nicely cooked and not overcooked. The filings were a decent portion and quite tasty. It was served with the requested toasted whole wheat bread and a side of fresh fruit. 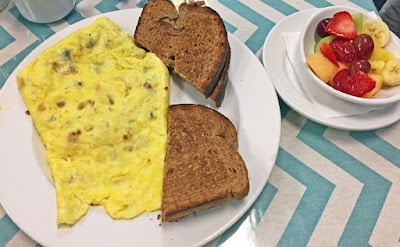 Everything about this omelet was spot-on, the way it should be. They know how to cook. 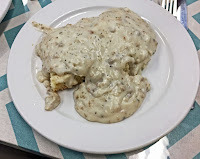 I could not pass up a half side-order of sausage gravy and biscuits. It was pretty good, better than a lot of places, but of course not as good as I can make. Still, I'd order it again. I think that it was home made. 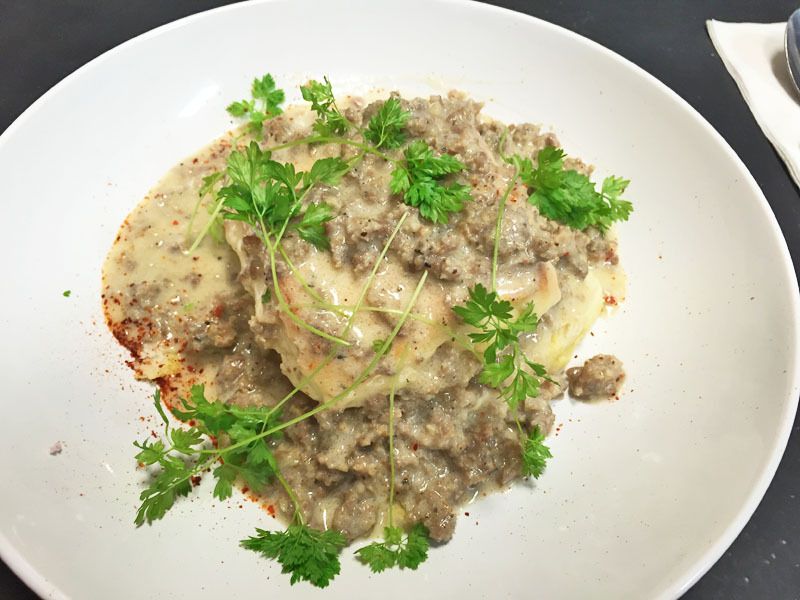 It could have used a bit more sausage and a bit less gravy, but still, I finished it up, with a bit of help. Tom had a "real" breakfast, sausage, eggs over medium, sausage links, home fries, and white toast. 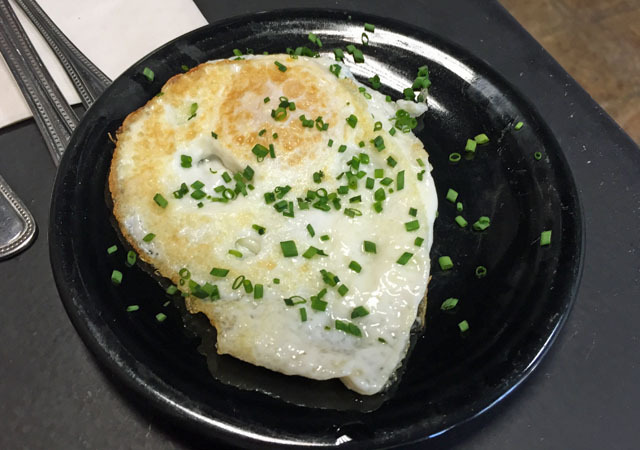 They eggs were perfectly done, over-medium. Everything was just like it should be. Peach's is a very nice place. It's open and airy and light in side. The service was very good, friendly and fast. Our food came out very quick. Our coffee cups were kept full. There was absolutely nothing not to like about this place, and I'd be happy to return, again and again and again! Well done! 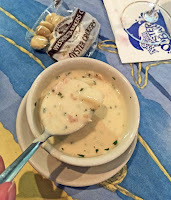 Anna Maria Oyster Bar has, I believe, 3 locations in the Bradenton, FL area. I can see why. The only thing that surprised any locals when we visited is that there was not a wait, but we were there after the "season" ended. Everything about our visit was top notch, we'd go again, for sure. We were a group of six and were promptly seated, greeted, and told about their specials, drink and food--we arrived during happy hour, luck for us! My cold Jai Alai and all the other drinks arrived promptly. For my dinner I ordered the Salmon Oscar, a nice portion of properly cooked salmon topped with crabmeat stuffing, hollandaise sauce, and asparagus. It was excellent, absolutely fabulous. 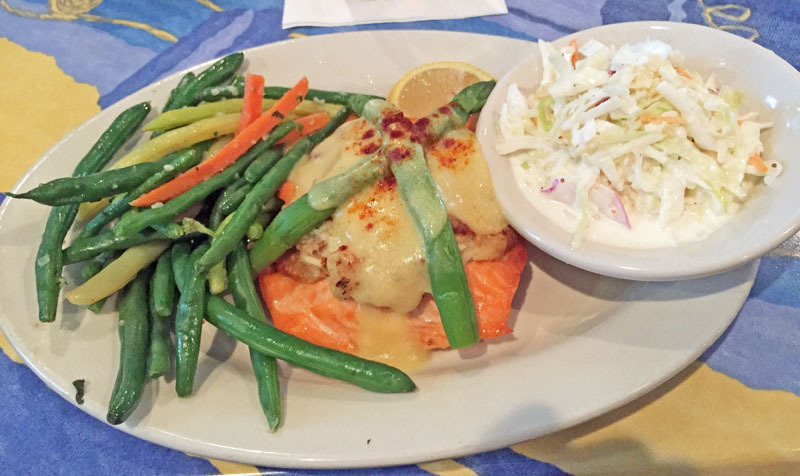 The salmon was moist and tender, and the crabmeat and hollandaise added to the richness. I had coleslaw for a side and I've never met a coleslaw I didn't like, this was no exception. The fresh green beans, wax beans, and carrots were also very good, nice and crisp. This was a very fine meal in every respect. Tommy started with the Lobster Bisque, and I had a taste: awesome. The bisque was velvety, smooth and creamy and boasted of a nice rich lobster flavor. It was also served with crackers, and if you knew Tommy, you'd know how important crackers are with his soup! A number of the friends we were with had a number of various dishes, including fish chowder which they said was good. As a matter of fact, everyone enjoyed their meals, without a doubt. Tommy, lucky for me, ordered the AYCE (All You Can Eat) fried shrimp. I say lucky for me because i may have speared on or two of them--or maybe a dozen or two! 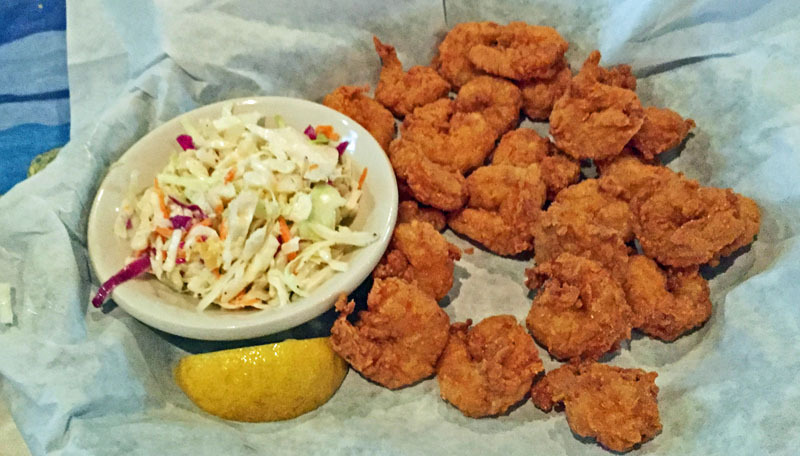 These shrimp were perfectly, perfectly deep fried, tender, crisp, buttery, and not at all greasy. I don't know how the do it, but I've never seen deep fried shrimp this perfect. A number of our friend had the same and the orders kept coming, promptly. I'd go there again just to order this. I'm telling you, these were truly outstanding. We all had a great time at Anna Maria Oyster Bar. They have a few locations and are very popular, we are told. I can see why! There are two parts to Star Fish Company, the market and a restaurant. 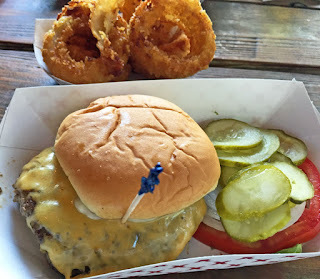 Though this review is primarily about the restaurant, we also shopped the market a different day, and I'll comment on that as well, because fresh can't be beat, and their seafood is certainly fresh! 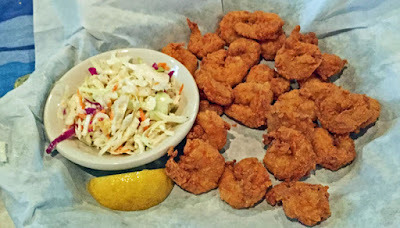 I decided to give the Fried Gulf Shrimp a try, as perfectly cooked shrimp are hard to come by. First off, the shrimp were cooked right, not overly cooked. I had them breaded and deep fried, but they were just a bit greasy, unfortunately. Tasty, but the breading was greasy. 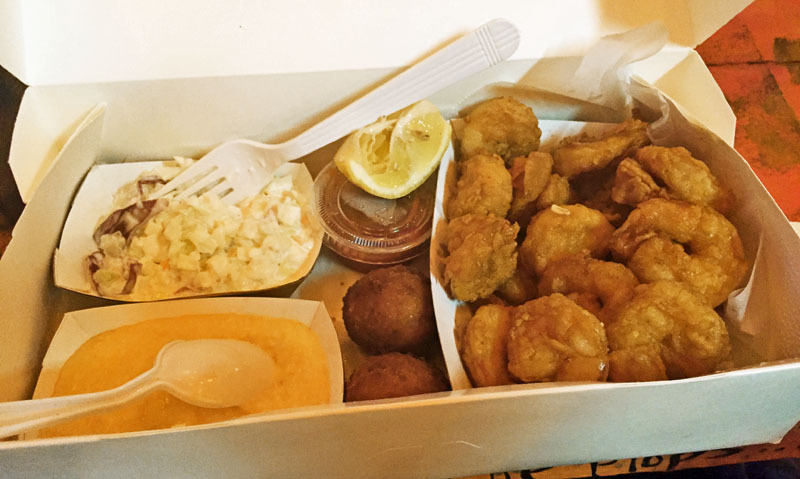 The cheesy grits and coleslaw I had to go-with, as well as the hush puppies, were both good. 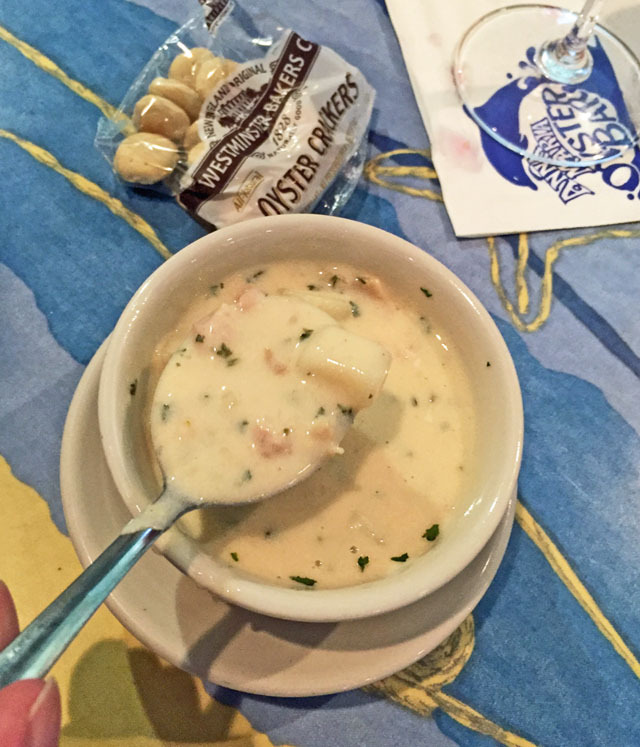 Tommy started with a bowl of the Seafood Chowder. However, it was a bit on the spicy side, too spicy for him, and I ended up eating most of it. The seafood was mostly fish of some sort, and the chowder was certainly very chili-like, with some corn, onions and a few other veggies. 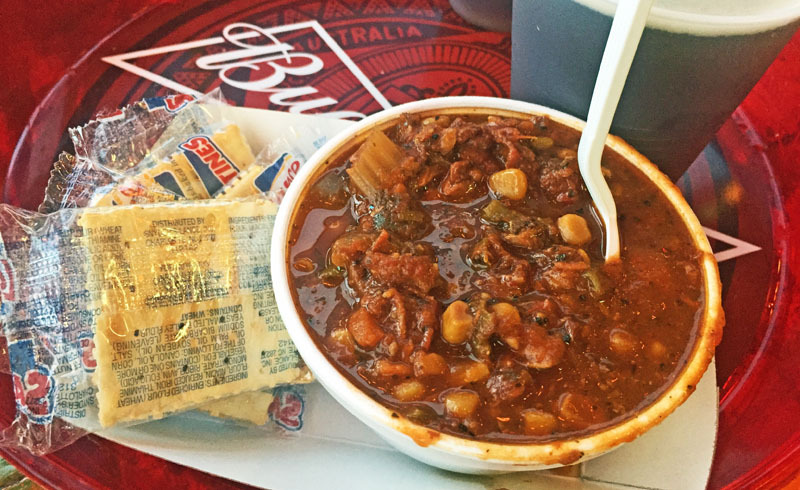 While it was good, it was not great, unless you really like a spicy chowder. However, Tommy's Grouper Sandwich did not disappoint at all. It was a nicely breaded and fried piece of fish, and not at all greasy. Served with the normal LTO (lettuce, tomato, and onion) on a bun, it was just a delicious sandwich. The fries were good as well. This is a real dive sort of place, a hole in the wall, but right on the fishing docks. 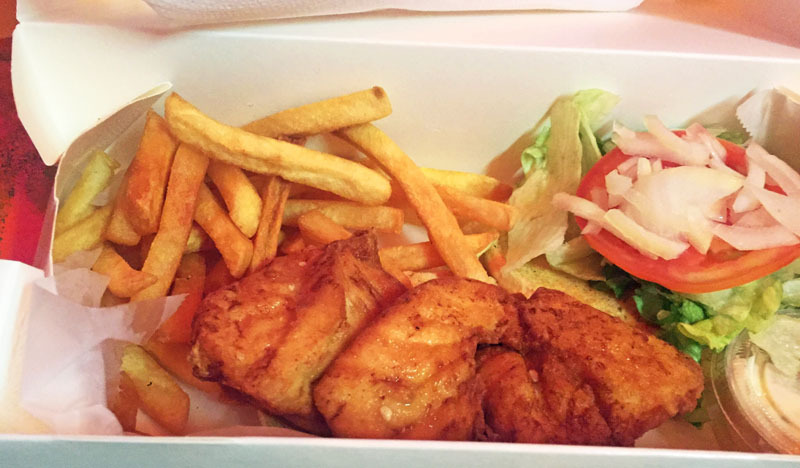 You order at the counter and give your name, and the dinners come out in waxed cardboard boxes. Find yourself a table or belly up to the small counter area. It's a hard to find place and very popular with the locals. Now for the market. We were on Anna Maria Island visiting with my cousins, and on a subsequent day, they were cooking dinner for us. There were six of us all told. Debbie went to Star Fish market for 3# of shrimp and 2# of ahi tuna. OMG. It was all so very good. She lightly seared the tuna and it was among the best tuna i've ever had. Wow. And the shrimp? She prepared them two ways, boiled for peel 'n eat, and scampi, sauteed in butter and garlic--both excellent. I'd say if you're looking for good, fresh, local seafood, check out the Star Fish Seafood Market, you will not be disappointed. I can see now why this place is a highly rated breakfast/lunch spot. 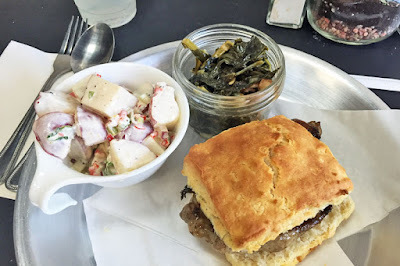 We decide to have breakfast/lunch at Sage Biscuit Cafe and I'm so glad we did. We were here on a Friday in late September, definitely after the peak tourist season. 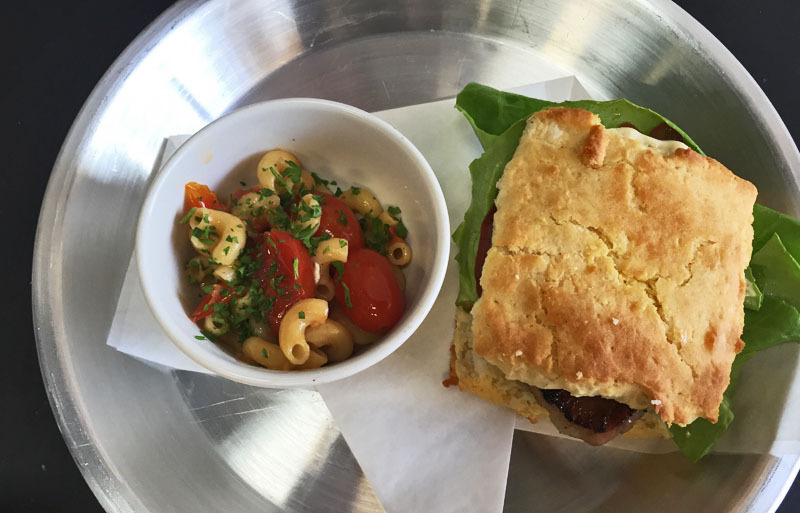 Sage Biscuit Cafe is in Bradenton along busy Cortez Avenue, but not at all hard to find and had plenty of parking. They were plenty busy, but not packed, and we were quickly seated and taken well care of. 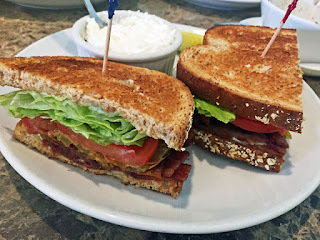 I ordered the Fried Green Tomato BLT, and was not disappointed, it was all I hoped it would be. There was a lot of bacon on this sandwich, nice and crispy. The fried green tomato gave it a nice zing and a regular tomato slice added to the tomato taste. The lettuce was very fresh and crunch. And the whole wheat bread was just perfect for this sandwich. I loved it, a lot. It was accompanied by a dish of cottage cheese. A very good sandwich, i'd order this again, no doubt. Tommy had the Eggs Benedict Capicola and said it was excellent--and the bite I had confirms that. He ordered it on a sage biscuit, though said next time he'd stick with tradition and have it on an English muffin. The sage biscuit was, however, quite tasty. The home fried that accompanied it were very good and not at all greasy. The hollandaise was just what it should be, and along with the creamy poached egg, made a nice counterpoint for the slightly spicy capicola. 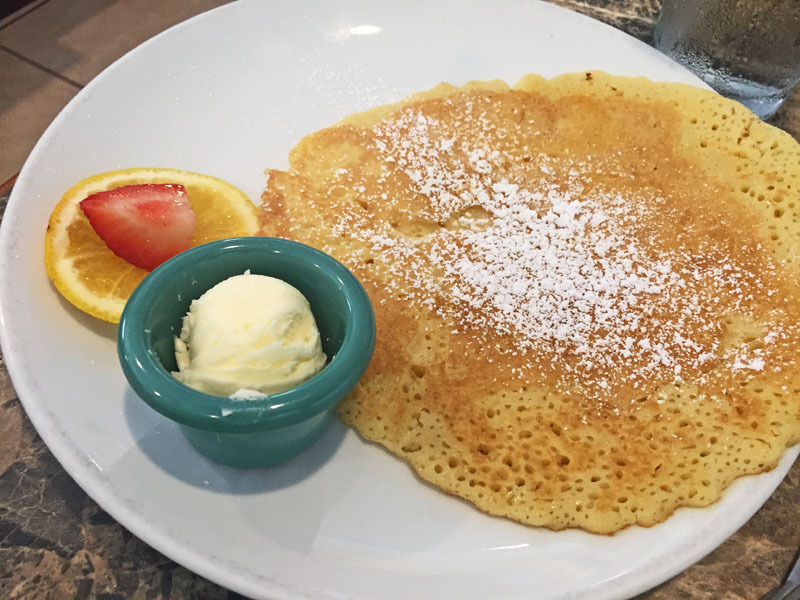 Tommy loves his pancakes, and since we rarely--if ever--have them at home, ordered a single buttermilk pancake to go with his breakfast. It was a very good pancake, tender, flavorful, all that it should be. We thoroughly enjoyed our meal here and I'd certainly go back. I can see why it's such a popular place. I encourage you to go and find out for yourself! We loved it. We had dinner last night at Don Julio Mexican Kitchen & Tequila Bar. I'm glad we got there when we did, because our wait was only a few minutes, but there were a number of people waiting when we left--a testament to the popularity of this place on a Friday evening. 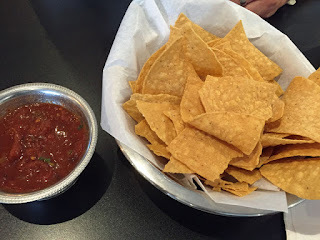 After our very short wait--only a few minutes--we were seated and quickly given some chips and salsa to start. Our waitress was there in what seemed like seconds to take our drink order. We learned that margarita's were on special for $3 so we opted for those. They were in fact very good, nice and refreshing on a summer evening. They appeared quickly and we were ready to order as well. The salsa was a bit of a disappointment. It was not bad, but was also not over-the-top good, either. It seemed to me that perhaps canned tomatoes were used? I could see/taste some onion and cilantro, and it had a bit of heat which I enjoyed. I'd have liked it to have been much chunkier and fresher tasting, that's all. It was just OK. But the "OK" with our meal did stop there, as everything else was very good. I chose to have the Quesadilla Don Julio, and requested a mix of carnitas and chicken for the filling. I was not disappointed. First of all, presentation is everything, and this was a nice presentation, as you can see. There was a side of yellow rice that was good, and also a side "salad" of lettuce, pico de gallo, sour cream and guacamole that was very fresh and refreshing. 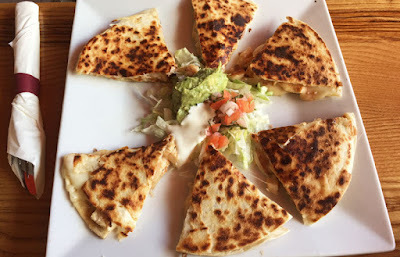 I loved the balance that it gave to the savory, gooey, cheesy, meaty quesadillas. 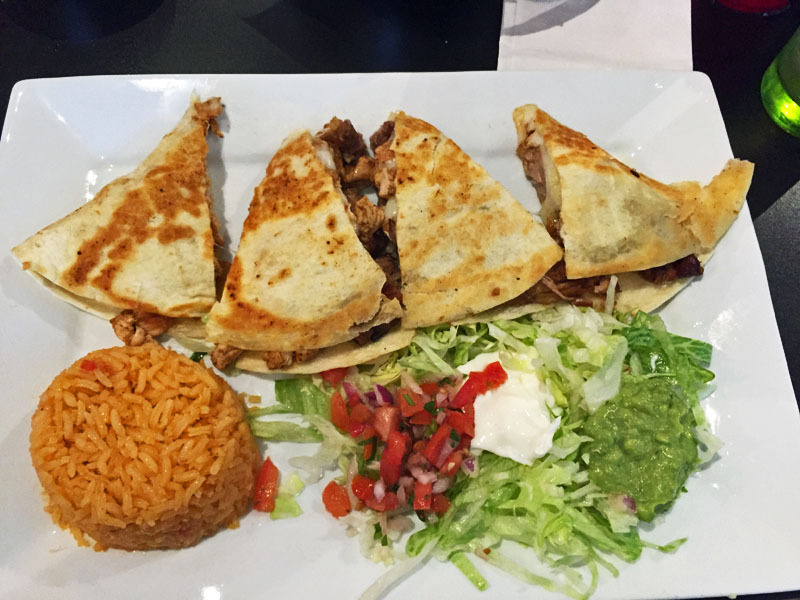 The quesadillas were excellent. Both the chicken and the carnitas were way over the top tender and good, and it was a nice and cheesy quesadilla. I loved it and had one piece to take home for another day, along with some rice. Tommy had the signature Chimichanga with the shredded beef. And again, presentation is the first impression, and the presentation again was marvelous. Take a look at that picture to the right. The deep-fried chimichanga was uniquely shaped--not a traditional rolled up, burrito-sytle, but was filled and gathered at the top, like a sack of sorts--it really was unique and tasty. 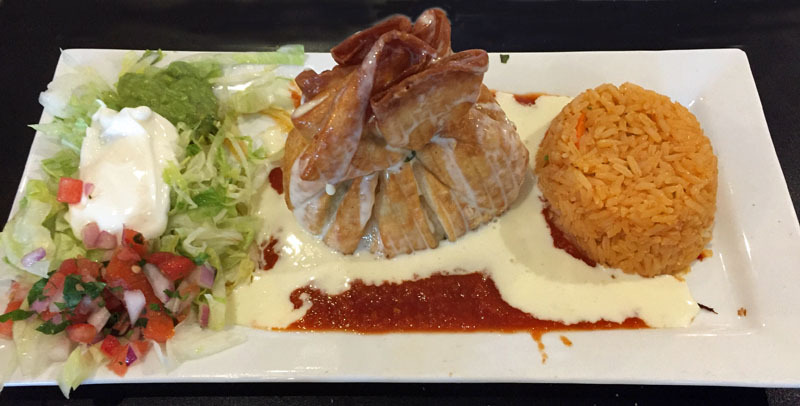 The chimichanga was sitting on a pond of queso and salsa. It was accompanied by the same sides I had. The flavor was very, very good as well. This was a good dish and Tommy had some to take home for another day as well. We both agreed, we'd eat here again. Don't let the "brewing" in the name fool you, because a few months back, Wop's Hops Brewing expanded into the space next door and now server some gourmet Italian bar food--and more. Wop's Hops Brewing is Sanford's first (and as of this writing, only) local micro brewery. Wop's Hops Brewing crafts English-style ales and does not use fillers, HFCS, GMOs, or other additives--the brew real beer and that is where they got their start. 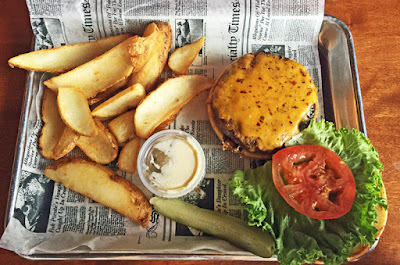 A popular local place, when the next door restaurant closed, Wop's Hops Brewing took the chance and moved into that space and started serving pub food, but good pub food, along with the beer. 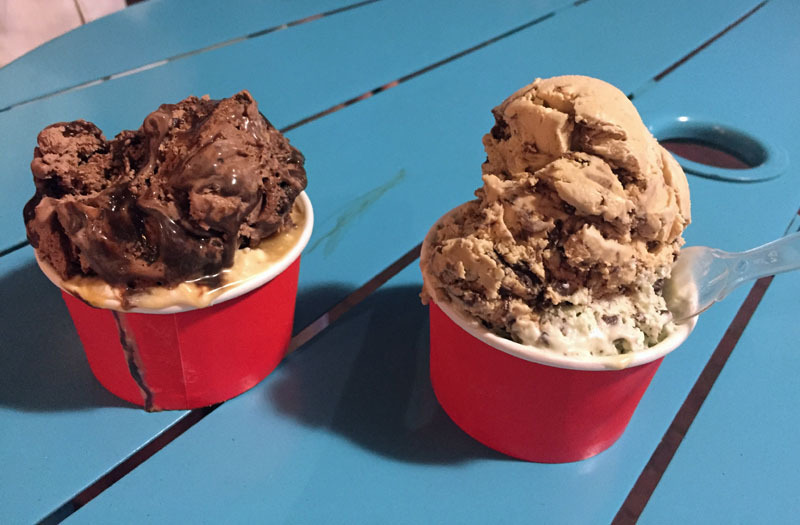 We recently gave them a try and did not leave disappointed. After selecting a beer, I ordered the Chicken Pesto Flatbread. I'd been by before during an outdoor event and saw a few of their flatbreads flying out the door. 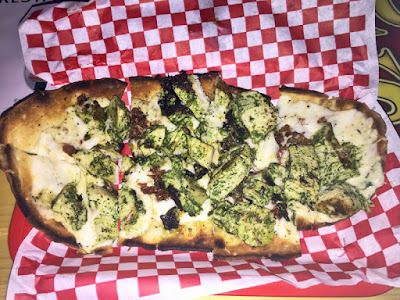 They looked so good and seemed so popular that I already knew I wanted a flatbread--and I was not disappointed. I was surprised, first of all, by the abundance of chicken, and a nice tender chicken here. Usually flatbreads are a bit lean in the meat department, but this was really loaded. I'd say for my taste, perhaps a bit high on the garlic in the pesto, but it was a great and filling dish--I even had some to take home to enjoy another day. 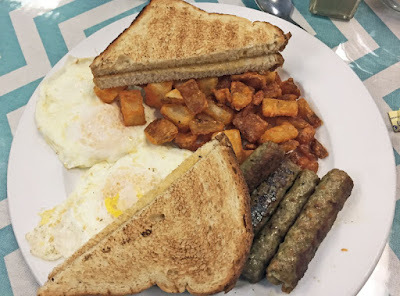 I'd get this again, though there are a few other items on the menu I want to try next time--and I know for certain there will be a next time, soon! Tommy chose the Meatball Sub, served with a pasta side. The pasta side, first of all, was very good, nice and tasty. He also got a side of "gravy" (tomato sauce) for the sub. Overall the sub was good--the meatballs nice and tender and tasty. I thought it would have been better had some of the sauce been served on the sub itself, but that's a personal preference. There was one misstep here, and that's what I consider a procedural step in the kitchen--the bun was slightly burned when they toasted it. Not terribly, horribly burned, but definitely charred a bit too much, I imagine the cheese burned, so that was just a bit off-putting. Not enough to ruin it or send it back, but it showed a bit of lack of attention to detail--if I were chef, I'd have redone it. Perhaps it was because the chef appeared to have friends in the dining room and spent time with them. But it was a bit of a misstep. Nonetheless and overall, we enjoyed our meal, and both took some portions home, the food was a healthy, full serving. And of course the beer and cider was also very good. Greg and his staff do a great job, and we felt very well taken care of. We'll be back, for sure. And, by the way, I spied someone having nachos. Not Italian, maybe, but definitely bar food, and they looked way good, too. I'll be back for them sooner rather than later. Oh, and about being Sanford's first and only micro-brewery so far--well, Sanford Brewing Company is getting set up about a block away and will be opening within a month or two with a full kitchen as well, and a smaller place, Inner Compass Brewing Company, will open sometime in the near future a few blocks away. Along with the downtown Sanford Homebrew Shop which supplies all sorts of brewing needs for beer, wine, cider, cheese, etc., and nearby Celery City Craft which has 51 craft beers and ciders on tap plus hundreds more in bottles and cans (and Celery City is set to expand later this year into a much larger space), Sanford is now truly a craft beer lovers destination. But the granddaddy of them all is Wop's Hops Brewing, they really started it all for those who truly treasure the experience of drinking craft beers and ciders. Come for the beer, stay for the food and fun, you won't be disappointed. They have a great outdoor patio which is fun in the cooler months and evenings, and often have live entertainment as well. You will not be disappointed, I guarantee it! I've stopped a Dreamy Cakes several times, and right now I wish I'd taken some photos of their unique interior. It's a very quaint, warm, and inviting place. When you step into Dreamy Cakes, you feel like you've stepped outside an old home that's been converted into a shop/restaurant--you are looking at the exterior of a home they've built inside. It's really worth stopping in just to see it. We've had their cupcakes a few times, but recently when my husband was working nearby and I had the day off, I stopped by to get lunch for him, to go. First I got the ham and cheese croissant. It was nice and buttery, and we split it, so it was filling. 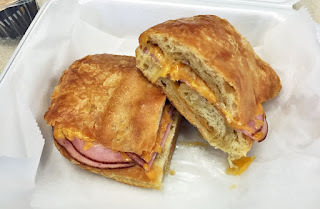 I do wish it'd had a bit more ham (and cheese, since I'm a cheese-a-holic), but it wast tasty. Nothing highly special, but definitely tasty and hit the spot. But of course the main draw here is their bakery, and at that they surely excel. 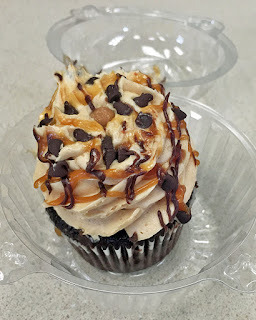 Tommy has the sweet tooth in our house, and so I ordered for him a Salted Caramel Chocolate Cupcake. OMG, it was to die for. First, let me apologize for the picture, the top got a bit smushed in the transport. But we've had this and other cupcakes at Dreamy Cakes before, and they really are good--tender, moist, tasty, and above all, highly sugary, topped "mile high" with a light, fluffy frosting. The presentation sure is wonderful, but the tasty very good. They have another item on their lunch menu that i want to try, a Walnut Chicken Waldorf salad that I've heard great things about--I'll have to give that a try next time, and I'm sure there'll be a next time. So next time you have a sweet tooth, be sure to try Dreamy Cakes, I'm sure they'll satisfy that craving. And lunch is pretty good, too. I think I'd eat in next time, just to enjoy the unique and warm outdoor-indoor feeling. I'd heard a lot of good things about La Spada's, so I finally decided to check them out for myself. The sandwich I had was indeed very good, but there were a few missteps along the way, too, so I'm not sure I'll be going back. Tommy had the cheesesteak special, an 8" with fries and a drink. 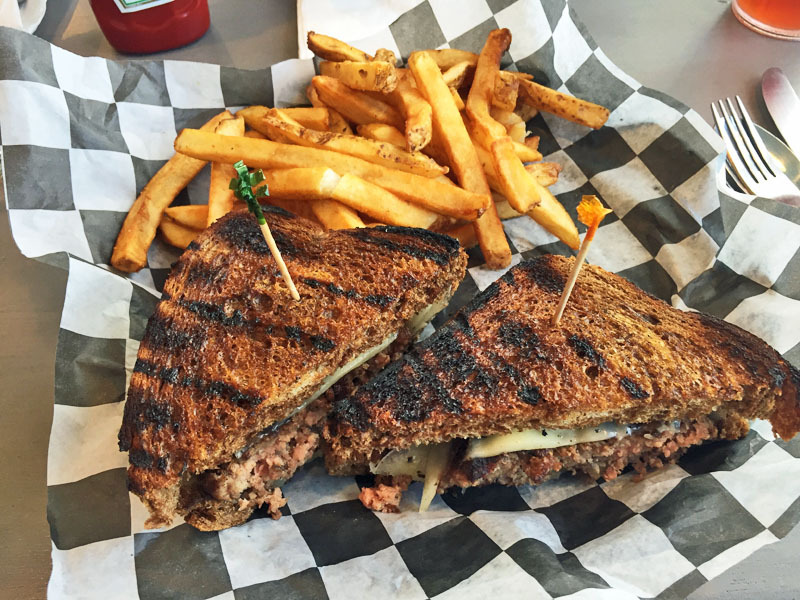 The sandwich was very good, and the fries as well, nice and hot, though the fries were rather ordinary. I'd guess they come frozen in a bag or the like. His came with a drink, and I ordered a drink separate. Now, to be honest, both the sandwiches were very, very good. I had no qualms about the quality of the sandwich. But there were a few other issues that I had. First of all, when we got there, the place is pretty "ordinary" on the outside. Let's just call it tired. The outside could use a bit of care. There's a corner by the door that just looks neglected. It could use a plant or two, something to say "we care about the looks of this place. Secondly, the interior is a bit dated. The "wallpaper" is peeling in places, it could use some attention. A few carpets or rugs were still piled atop a garbage can. I got the impression that "we don't really care a lot about how this place looks." When we found a table, we had to clean it ourselves. In our whole time there, no one came out and wiped any of the tables. Even though they had time to stand around. Again, not once did anyone come out of the kitchen area--even though at times they were standing around--to pay attention to and clean up the dining area. This, to my mind, is a cardinal sin. The three employees there were not very professional looking. All were wearing whatever t-shirt they decided to wear, nothing that said "we are La Spada's." I watched while one employee, wearing gloves from (I assume) handling food, came out and did some stuff in a freezer out front, still wearing the same gloves, then went back behind the counter, and continued to work with food, still wearing those same gloves. Upon leaving, I took a good look at the grill area. The wall behind the flat-top seemed, to me, a bit dirty with a greasy build up. The stainless front of teh grill seemed to be dirty, more than just from the day's activity, I'd guess. As we were sitting and eating, I noticed the windows were really dirty. The whole interior looks like no one really cares a lot or cleans a lot. It was really rather dirty and dingy, overall. On top of that, the counter was cluttered, the signage was messy and sloppy, and the whole feeling I had while there as "we don't really care a lot." The "daily specials" sign at the counter had been edited with sticker over the prices--I'll assume raising prices. But at any rate, it was sloppy and unprofessional. There were a bunch of signs there, one falling off. It just looked sloppy and messy. Very unprofessional, like a really old, greasy diner that is past its prime. So, overall, while the food was good, I was totally unimpressed by the decor, the cleanliness, and the unprofessionalness of the employees. It just did not impress me at all. Will I go back? I doubt it. I know where to get an equally good cheesesteak in a better maintained atmosphere in Sanford. Should you go there? Well, that's up to you. The food was good, but the service and value were lacking, in my mind. But go and see for yourself. Feel free to disagree with me. But take a good look around when you go there and see if you see what I saw. And be ready to sit at a dirty table or clean it yourself--that's what we experienced. We have been to Candlelight Cafe several times now since the first opened, so it's about time I wrote about the wonderful food here. 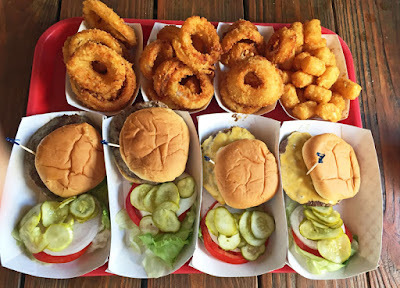 We've been here before, and will keep going back because the food is king, and a great value to boot. Chef Sennet Williams, Patti McGarry, and all the staff there work hard to make sure you have a great experience and do not leave hungry. Trust me on this, you will not leave hungry! 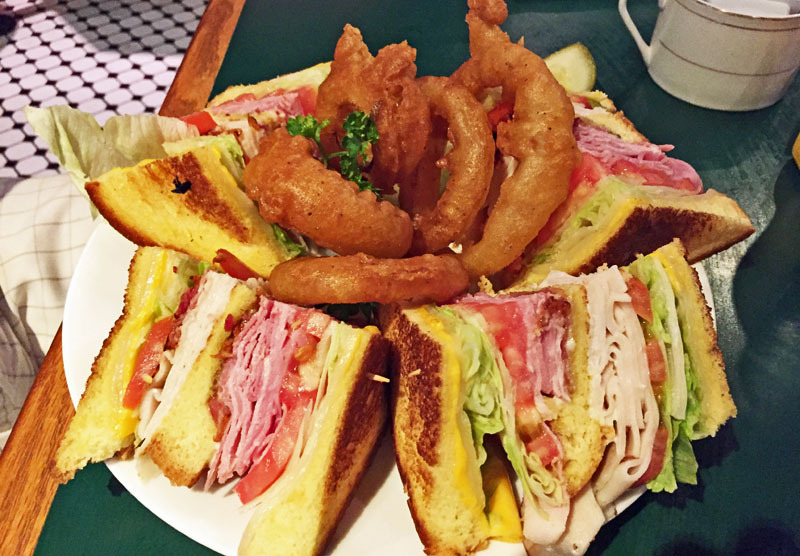 Tommy had the club sandwich, but asked for Chef to add some bacon. OMG. The sandwich was huge, as you can see in the photo. 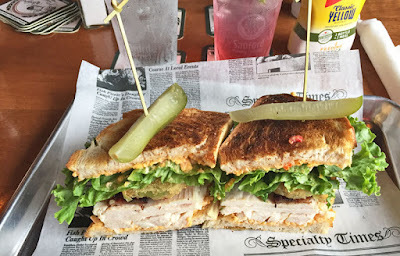 This was a triple-decker, ham, turkey, lettuce, tomato, cheese and bacon layered in a way that it was impossible for a human to take an incomplete bite without unhinging a jaw--but it was oh, so good. The bread was very good and nicely toast. 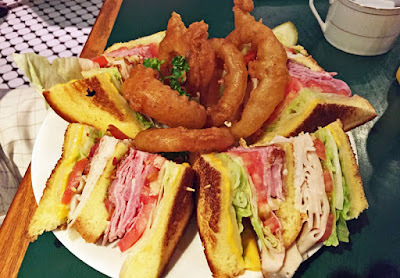 This was a HUGE sandwich, and we ended up taking half of it home--it made another whole complete meal. Where else can you get a sandwich this huge and this good that makes two full meals. 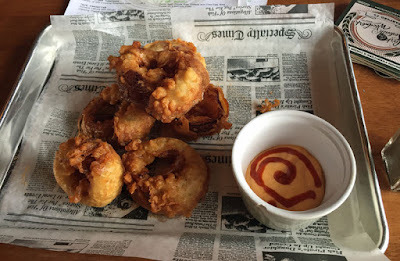 Oh, and the onion rings were good, too. 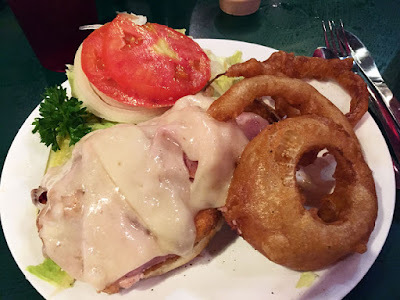 I had the special, a chicken cordon bleu sandwich. A chicken breast had been breaded and deep fried, then covered in ham and cheese, and grilled. It was served with LTO (lettuce, tomato, and onion) on a bun with some mayo. 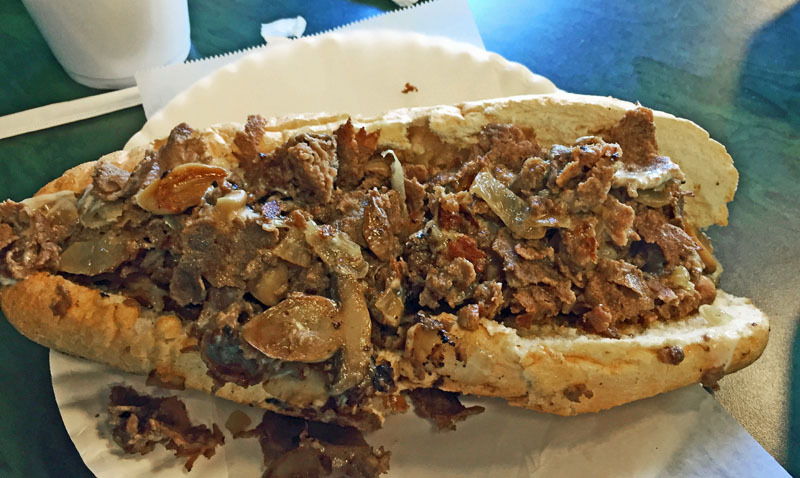 Well, this was a very messy sandwich--good, but messy. The small end of the breast was a bit tough and overcooked, but overall the sandwich was very good, and the ham and cheese--as well as the LTO--brought a lot of flavor to this party. O did manage to finish it, but just barely. At the end I had to use a fork and knife, and left a bit of the bun and onion on the plate, it was just too much to eat, but pretty darned good. We had a chance to visit a bit with Chef Sennet Williams. He is always willing to accommodate special requests, so don't hesitate to ask for something special or not on the menu. He offered us a number of other things, each one sounding better than the one before. Beside being an excellent Chef, he is also a big supporter of Sanford and the community. 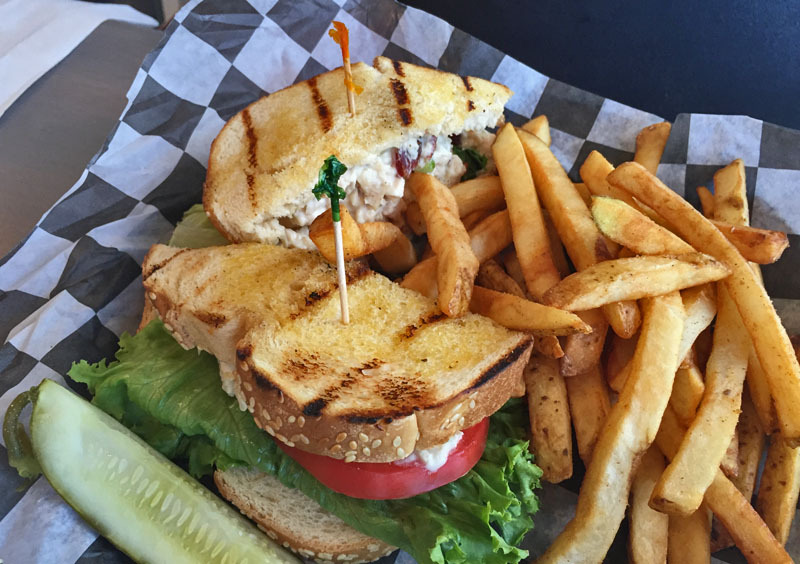 Candlelight Cafe is a great and welcome addition to the Sanford dining scene. They currently serve breakfast and lunch. Give them a try, you WILL NOT be disappointed, I promise you. And if you have a special request, just ask and you shall receive! Oh, and by the way, we had the remnants of the club for a late night dinner later that night--outstanding! We recently had dinner at the new Jimotti's Restaurant and based on that experience, we will be back, and soon. 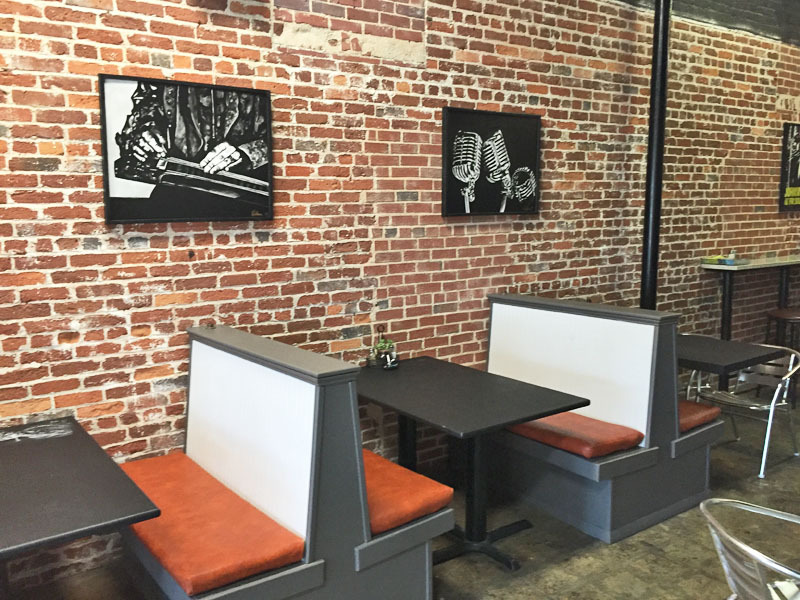 "Jimotti" means "local people" in Japanese, a fitting name for a new locally owned restaurant, a welcome addition to the growing Sanford restaurant scene. They specialize in high quality Japanese food, using local fresh ingredients as well as some fish imported directly from Japan. While their start is sushi and Japanese food, the menu is varied and also caters to more traditional American tastes as well. In the restaurant world, Chef/Owner Junichi is no newcomer to fame, having cooked for many Hollywood celebrities including Oprah, and he helped open "Morimoto's Asia" at Disney Springs. And now he has brought his talent and skills and attention to detail to Sanford. Lucky Sanford. We arrived shortly after 5 on a Friday afternoon. Lucky for us, it was happy hour with Kirin Ichiban beer for $3 a glass and several appetizers on special ($5). We were promptly greeted and seated. Our waiter was polite, friendly, and knowledgeable, and the one time he did not know the answer to our question, quickly found out. After ordering drinks (the Kirin Ichiban for me, a glass of wine for Tommy), and after a lot of studying of the menu and questions answered, we ordered. Our food appeared rather quickly, too. 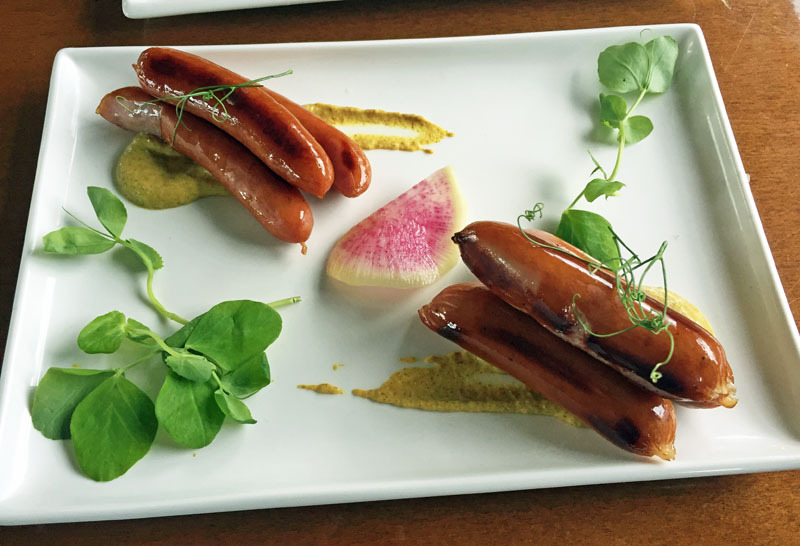 For an appetizer I had the "Sausage Bro," two sets of three small sausages. First of all, the plating was superb. 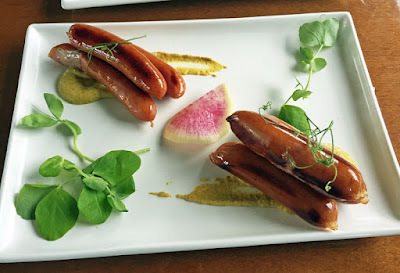 The sausages were sitting on a smear of whole grain mustard (itself very good), garnished with some peas and a slice of watermelon radish, and further topped with a tiny bit of pea tendrils. Very pretty plate. The sausages were superb. Though both very good, for some reason I slightly preferred the ones on the lower right. But all were extremely tasty, flavorful, and quite juicy. The mustard was a nice compliment. This was a very good dish, and i would assuredly order it again! 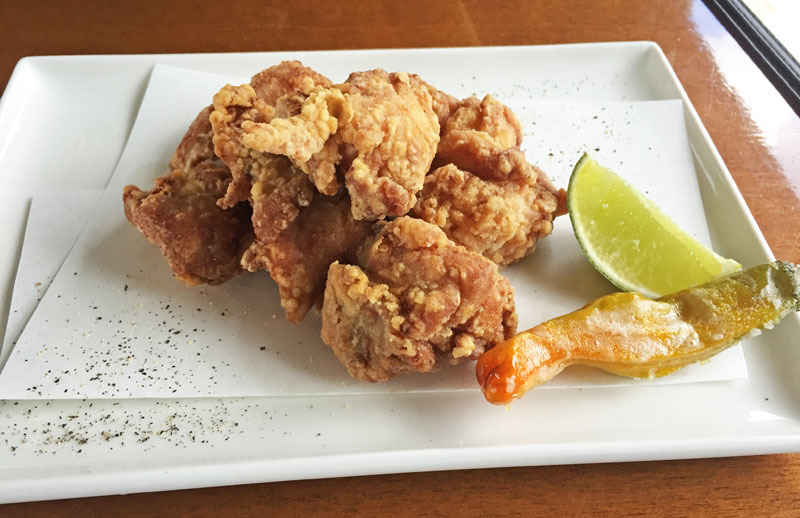 Tommy ordered the Kala-ague for his appetizer--Japanese Fried Chicken. Chicken thigh muscles were divided here, sort of tempura-battered, and fried. First of all, the chicken was extremely tender and juicy, full of flavor. I think it could have used just a tad less salt, but was very good. The plate was garnished with a battered, fried pepper (a bit hot) and a slice of lime which we put on the chicken. This too was very good. Different than traditional American southern fried chicken, it was still excellent. You cannot get chicken this good at a traditional grocery store, it was bursting with flavor and as tender as any i've ever had. And perfectly cooked, too, just perfect. Another thing we'd order again. Finally, it was down to the entrees. 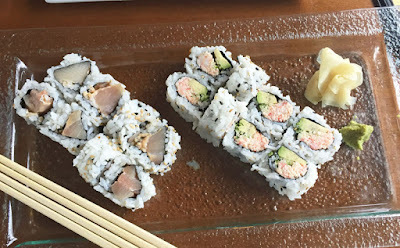 We were in a sushi restaurant, and so we ordered sushi: the Spicy Yellowtail Roll for me, and a California Roll for Tommy (who is not a friend of uncooked fish). 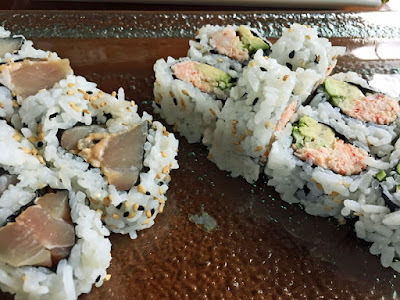 My Spicy Yellowtail roll was very good. I thought it could have been a bit more spicy, but it was still very good, the fish very tender, the flavors right on. Tommy's California roll was pretty typical for a California roll, but certainly well executed. We were very happy with our choices. I would say that the wasabi, to me, was a bit underpowered. I like a very, very strong wasabi and this was fairly mild. But that's a minor point, we still loved what we had to eat and will certainly be back. One other thing to point out, and that's the attention to detail. If you look closely, you can see regular and black sesame seeds. You can also see the delicate texture and color of the Yellowtail. My guess is that this was Japanese amberjack, but whatever, it was excellent. Several times during our meal, we were graced with Chef Junichi himself, who checked to make sure everything was to our liking. 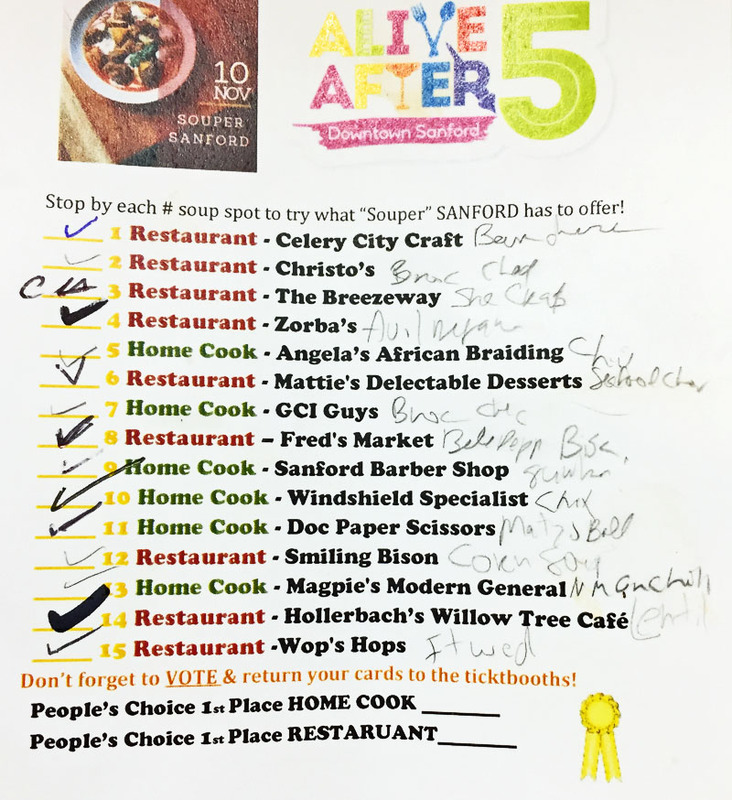 We also has a nice conversation about Sanford in general and Alive After 5, one of our favorite Sanford events. It sounds like he may come next month and participate and promote his restaurant. I sure hope he does, because this is a gem of a place. Jimotti's has been a few things in the past few years, and is an older place. But they have put a lot of time and effort (and paint) into cleaning it up, updating an modernizing what they could, and making it an inviting place. I think they'll be around for a long time. It's really very good and I'm already scheming for my return visit. I have some friends from College Park that really like good sushi, i think I'll invite them, and I'm sure they'll be impressed at what Sanford has to offer! Give it a try, I think you'll be amazed, just like we were. Otters on the River has undergone a number or name changes over the past few years, I cannot remember them all, but that tells you something. However, with the latest name change came a remodel and I must say, it looks pretty nice inside, they've done a good job. I'm not quite sure if they're finished, there was a stage-like area where they were still doing something, there was someone doing some sort of repair outside when we were there, and, oddly enough, there was a tall ladder in the middle of the dining room, just sitting there, when we visited. We went on a Friday evening about 5, hoping to avoid any dinner rush. We didn't need to worry, there were not many people there, but more arrived later. Otter's on the River is located in a marina on the St. John's River, at the west end of Lake Monroe. It's a nice location and has a lot going for it. It's a restaurant/bar in a marina, and they have a large patio and pool area, i can imagine this being very popular on a weekend with boaters and families. It looks like a fun place, definitely. 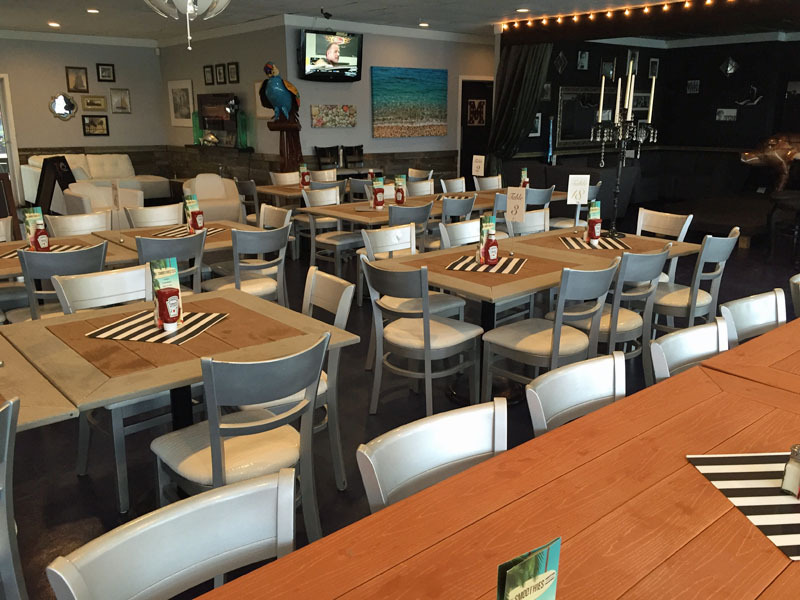 The recent remodel brought the dining area up a few notches and it looks much better and more modern than in the past. It's a pleasing space inside. Outside is pretty typical for what you'd expect at a marina, though probably a fun place when the sun is low. Our service was pretty good and our dinner was pretty good. The waiter was new but did go to find the answer when asked a question about the menu. Tommy had the Chicken Salad and it was indeed delicious, with lettuce and tomato on toast. He really loved the fries, and I have to agree, they were very good, nice and crisp and well seasoned. All the food was fresh and flavorful. This was a hit as far as Tommy was concerned. For my dinner, I had the "Ice Age Melt," basically your typical patty melt, one of my favorite sandwiches, and also had fries. The sandwich itself was pretty good, though a bit dry. When i ordered, i specified medium-rare, but what i got was really well done. With a bit of imagination, maybe medium-well, but it was, IMHO, just overcooked a bit. 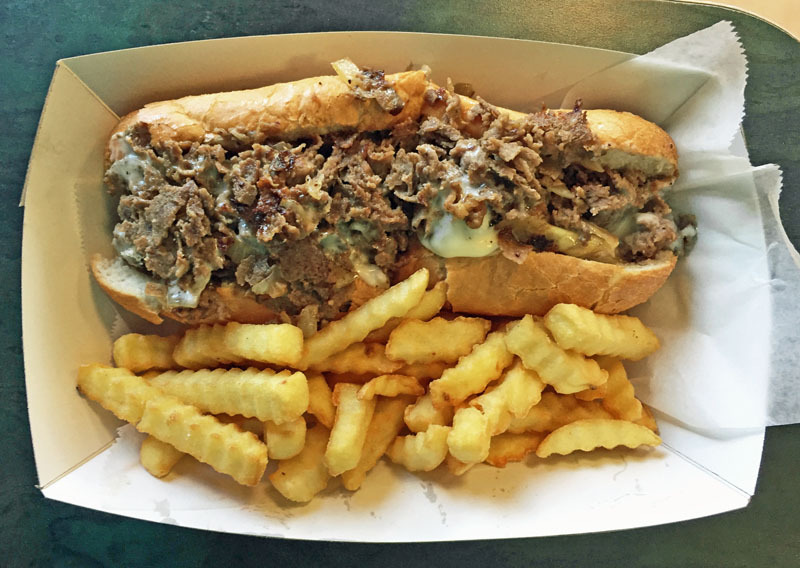 The onions and cheese were good, but again, the meat itself was just a bit dry. The fires were likewise good. Overall, we had an OK experience. I guess I was a bit put off by the empty ladder in the middle of the dining room, and the activity on the stage, moving a piano I guess, and the repairman outside. I can understand those activities need to happen, and maybe they were happening because it was slow, but it was just a bit odd. I am torn on giving this place a 3 or a 4 out of 5. It's really a 3.5 in my book. For me, it was good, but not much more than average. Still, i hope you give them a try and let me know what you think!